Small lots can be planted densely if cared for with detail. 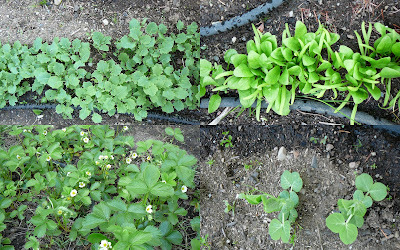 You can plant many different types of vegetables together. They needed to be tended to daily, since animals, location, wind, and rain can be damaging. Some fertilizer is good. Too little or too much is not helpful. You need to cook and use your vegetables to get a good return on investment. The 49th parallel has a short and intense growing season. Lack of sun early on is an issue. Fortunately, water is not so much a problem here as in drier climes. There are "start-up" costs for large scale "urban farming" (e.g. tools, hoses, plastic, stakes, etc.). These costs need to be amortizes over time for urban gardening to have a competitive ROI. Gardening success is an art, but it is also an art of developing workable systems and work habits. Without attention being paid to systems analysis, urban farming is probably just an enjoyable hobby. The quality of fresh picked food that you integrate into your families diet has a strong spiritual and personal reward. Nothing keeps you feeling fit like a day turning over soil with a pick and shovel. I predict there will be a strong renaissance in urban farming and gardening. Quick Books has shown us that our grocery/restaurant bill is our highest 'non-revolving' expense now, which was a stunner. We have invested in energy saving vehicles, heat-pumps, and conservation architecture, otherwise our combined vehicle payments, gas, maintenance would be in first place. Or perhaps our "combined household energy bill" (Electricity, Petroleum, Natural Gas). I suspect that for many of you with homes and families, this "combined household energy bill" is your largest 'non-revolving' expense and especially with petroleum currently at $4/gallon in the States. (Yea, I know. Europeans are rolling their eyes right now as they read this...) But, in truth, most American families are being hit hard by high energy costs. We are used to very cheap energy. What most American families may not be thinking about is how much the increases in the price of diesel has increased our food bills in the last 10 years. Unfortunately, it is unlikely that such a trend will regress in favor of the consumer. What is more likely is that most families will become expert "urban farmers", probably forming informal collectives on their block, trading conserves, fruit, jam, jellies, produce, and local gardening equipment and information. There is nothing new about this. Most of our grandparents and great-grand parents survived the depression with such efforts. Urban farming could have quite a democratic effect. Nothing really brings people together like shared food. Except for maybe the experience of raising small children. And urban farming is a fantastic activity to get the family involved in.